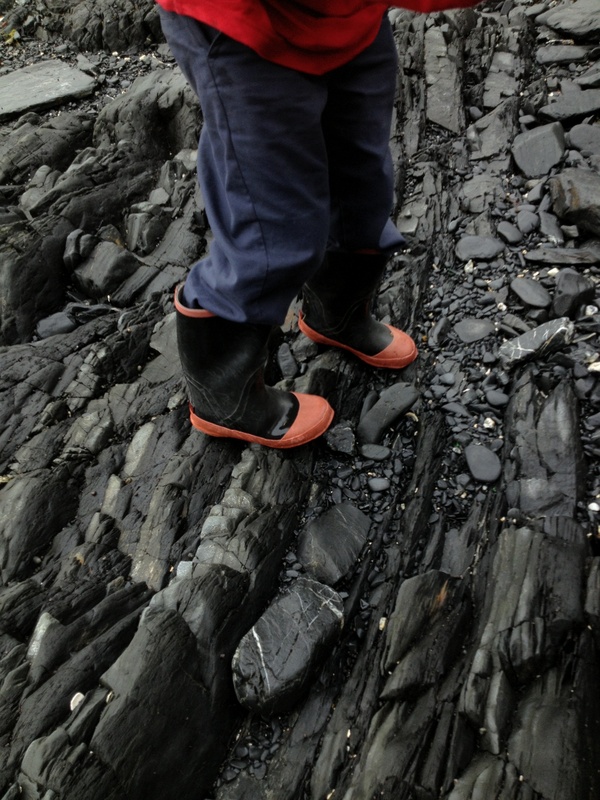 I scour the rocky beach with my young friend Micah. 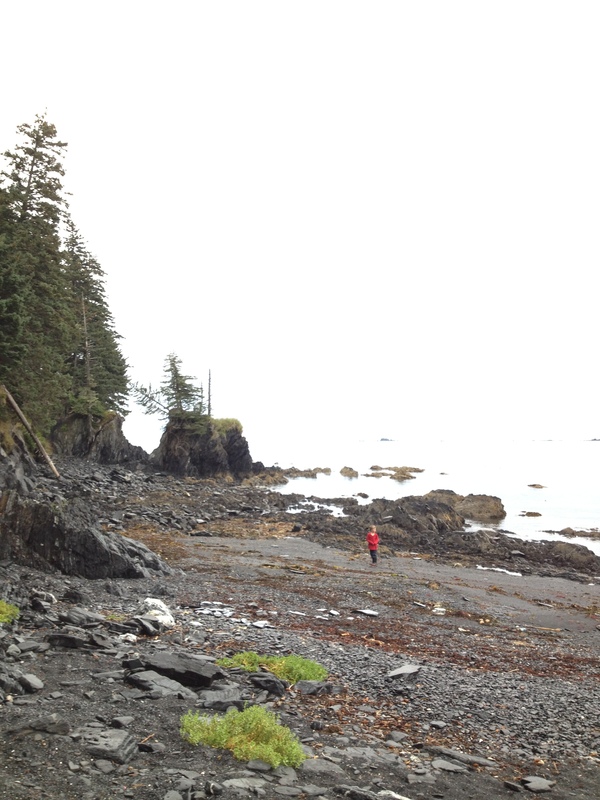 Through his eyes I’m discovering all the wonders of this remote bay in Kodiak. 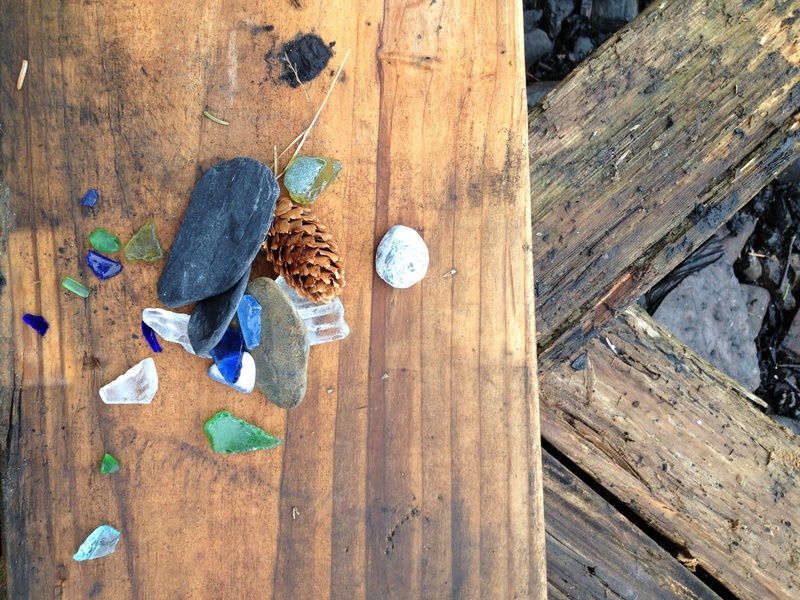 A simple request to see the bay has evolved into a scavenger hunt along cliffs and boulders. As I scamper over barnacled rocks in my slippers, I’m transported into Micah’s playground of tide pools, tiny hermit crabs, even a sea urchin. Jagged rocks loom large like sentinels over these beach treasures. But the treasure that most catches my eye glints slightly beneath the puzzle of smooth , black, flat beach rocks perfect for skipping in the ocean. “What is that?” I ask Micah as he chooses the perfect stone to throw into the water. He stoops down to look at the tiny blue treasure. “Sea glass” He picks it out, cups it in his hand and hands it to me. “Blue is the best color. That’s the most rare on this beach. That’s my favorite. “I examine the tiny sapphire jewel in my hand. The color is deep. The edges round and smooth. 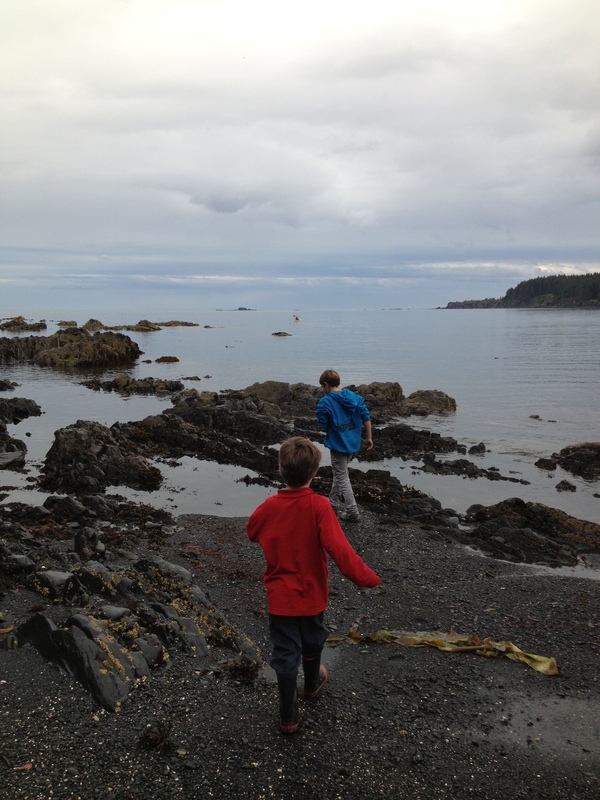 Over kelp bulbs, seaweed, rocks we scramble until Micah and ruddy cheeked 5year- old Stuey lead me to the promised land. “Look at this one,” says Stuey . In his chubby little palm lays a perfect piece of aqua sea glass. “Oh, that’s beautiful. Can I have that piece?” I ask. His little blond head ponders for a moment. He shakes it back and forth. “No,” he says. “I like this piece.” He scrambles off to find some more. A little miffed I crouch down to seek out my own. I discover a large blue piece to examine. I love the color. “What about this one?” I offer. Shattered from the impact of watching my mother decline. By this disease called Alzheimer’s. Guilt divided between duty to my children and husband and duty to her. as I watch this disease wear down my mother. A treasure to be found. As are the colors blue and aqua. Only gilded by the coat from the sea. Back to the sea as you make a wish. Or a miracle or her memory back. And clutch it to my heart. Vina, Melanie probably told you that I thought that is such a beautiful writing. So profound and I loved your thoughts. Elsie…..I know you have been an angel to many with your gifts you share bedside. Thank you for your sweet encouragement. Sweet friend, this truly blesses me today. You are a treasure to me and I thank our God that you have found such a lovely and creative outlet through the pain. Love you. I love this piece! Your photos are stunning! you are stunning my little blogger friend….i always enjoy all of your posts! you are way more productive than I! Beautiful writing……I like you am a caregiver of an aging parent who I wish to hold on to; yet see slipping away from the woman she once was. Thank you for sharing this piece. It reminds me of what I have to be thankful for and that I am not alone in “the caring of an adult parent. It’s hard, I know. Some days I feel bitter and angry and I cry and other days I rejoice . There are times I get upset that I am being robbed of time to live my life; then I feel so remorse at the fact I had such a thought. I journal (use to blog) to release what I think no one else feels; then somehow the universe will show me I am not alone. Jacquie…..yes my dear we are not alone. I am learning that more and more as I hear others’ stories. And I completely understand the angst you feel when you have thoughts you don’t think you should have. I’m glad this encouraged you….anytime you want to vent feel free! keep journaling, it is a lifesaver! V, This touched me when you sent it to me from Alaska, and as I read it to T, it touched him … And a few months later I read it and realize how beautiful your expression as a writer is and how you have such a gift and ability to heal souls with your words! Love you. Melanie you are such an inspiration and encouragment to me, and I am so glad you are alongside this part of our life journeys…….